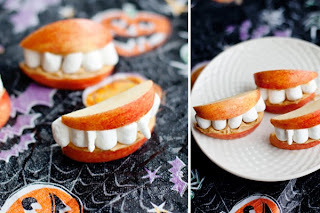 Here is a adorable "Halloween treat" to do for the kids. They are easy to make and perfect for the kids to take to school for a treat. 1. Slice each quarter in half and then in half again, lengthwise, making a total of 16 slices from each apple. 2. Spread peanut butter on one side of each apple slice. 3. Line up 4–6 marshmallows on top of peanut butter on one slice and then top with another slice. The peanut butter will serve as glue to keep the “teeth” inside the mouth. To make the vampire fangs, use a sharp knife to cut a marshmallow into two triangles. Use peanut butter to stick them between the “normal” teeth. 4. Continue with remaining apple slices and serve.